© AP Photo/Evan Vucci White House chief of staff John Kelly listens as President Donald Trump speaks during a cabinet meeting at the White House, Monday, April 9, 2018, in Washington. Kelly called the allegations "total BS." "I spend more time with the president than anyone else and we have an incredibly candid and strong relationship," said Kelly in a statement. "He always knows where I stand and he and I both know this story is total BS. I am committed to the president, his agenda, and our country. This is another pathetic attempt to smear people close to President Trump and distract from the administration’s many successes." Three White House spokespeople said they don't believe it's accurate that Kelly called the president an "idiot," adding that none of them has ever heard him do that or otherwise use that word. Trump, who aides said has soured on his second chief of staff, is aware of some though not all of Kelly's comments, according to the current and former officials. The White House spokespeople said they haven't heard Kelly talk about himself as the one saving the country, and that if anything he may have spoken in jest along those lines. 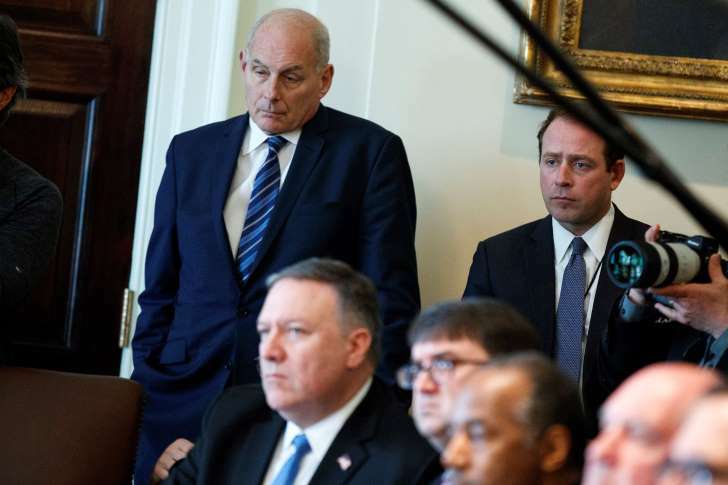 Presidential historian Michael Beschloss said Kelly's comments about Trump, when compared to previous White House chiefs of staff, "suggest a lack of respect for the sitting president of a kind that we haven't seen before." Beschloss said the closest similarity would be President Ronald Reagan's chief of staff during his second term, Don Regan, who "somewhat looked down on" his boss and eventually lost the support of the staff and the president. Regan was replaced after two years by Howard Baker. The last time it became public that one of Trump's top advisers insulted his intelligence behind his back, it didn't go over well with the president. White House aides have said Trump never got over former Secretary of State Rex Tillerson calling him a "moron" in front of colleagues, which was first reported by NBC News. Trump later challenged Tillerson to an IQ test and fired him several months after the remark became public. "Kelly appears to be less engaged, which may be to the president's detriment," a second senior White House official said. Kelly has maintained at least two close allies in the West Wing — Kellyanne Conway, counselor to the president, and White House counsel Don McGahn, current and former officials said. The White House spokespeople conceded that Trump gets frustrated at times with Kelly, particularly when he feels Kelly is not giving him all the information he needs and wants. They said Kelly and Trump have an open, candid relationship. The spokespeople disputed that staff has lost confidence in Kelly, saying he's still chief of staff so when he issues an order aides comply and that "for the most part the staff still respects and genuinely likes Kelly." The White House spokespeople said they haven't seen Kelly have a negative effect on the morale of women staffers. If anything, they said during meetings Kelly is the "bigger gentleman" who steps in when aides use foul language to note "a lady is present" and similarly says he shouldn't use foul language in front of a lady if he's used an expletive. The spokespeople, who would not speak for the record, said it's possible Kelly may have said women are more emotional than men, with one of them agreeing that "generally speaking, women are more emotional than men." "WE'VE GOT TO SAVE HIM FROM HIMSELF"
Kelly entered the White House with a mandate to instill order in a West Wing where aides regularly had unfettered access to the president. He adopted some key changes, such as shrinking the number of people in meetings and limiting access to the Oval Office. He has also pushed back against the president on some foreign policy and military issues, current and former White House officials said. In one heated exchange between the two men before February's Winter Olympics in South Korea, Kelly strongly — and successfully — dissuaded Trump from ordering the withdrawal of all U.S. troops from the Korean Peninsula, according to two officials. For Kelly, the exchange underscored the reasoning behind one of his common refrains, which multiple officials described as some version of "I'm the one saving the country." "The strong implication being 'if I weren't here we would've entered WWIII or the president would have been impeached,'" one former senior White House official said. Kelly has made similar comments to lawmakers, at times making fun of what he sees as Trump's lack of knowledge about policy and government, current and former officials said. He's been particularly cutting when it comes to immigration issues, which he considers one of his policy strong suits, having served as Homeland Security secretary and head of the combatant command for U.S. military operations in Central America and South America, the officials said. Kelly held a series of meetings in his office with White House officials during negotiations with lawmakers on funding for the president's border wall and a resolution on a program — known as DACA — that allows some people who were brought to the U.S. illegally as children to remain in the country, according to four officials who either attended or were briefed on the meetings. He often used the settings to express concern that Trump would agree to a deal that's not hardline enough on immigration and criticized the president's knowledge of the issues to underscore his point, the officials said. "He doesn't even understand what DACA is. He's an idiot," Kelly said in one meeting, according to two officials who were present. "We've got to save him from himself." After the talks on a bipartisan deal fell apart, a collapse Kelly helped orchestrate with some conservative Republicans, he told aides in his office: "If it weren't for me the president was going to agree to some hasty deal," according to two officials who were present at the time. Three White House press spokespeople said Kelly did express concern in meetings that Trump would agree to a deal that was too soft on immigration, and after bipartisan talks collapsed told staff that if it weren't for him the president would have cut a bad deal. The spokespeople also said Kelly may have said something along the lines of, "The president doesn't know the full impact of DACA." But they said they don't believe he called him an "idiot." The spokespeople disputed that Kelly is less engaged in his job. They said he still sees the president and is in the Oval Office more than anyone else. They said Kelly put a much-needed system in place in the West Wing and has over time felt the need to hover less over the president. They said Kelly is still the first person in the White House at 6 a.m. "The president talks to a lot of people but no one talks to him more than the chief of staff," one of them said. The spokespeople said they have not heard Trump talk seriously about withdrawing all troops from the Korean Peninsula. One person who has known and worked with Kelly over the years said he uses "coarse language" when he is in what he believes to be trusted company. The public has seen some glimpses of the Kelly that White House officials describe privately. In October, he made comments about a Florida congresswoman that were not accurate. He also remarked that when he was growing up "women were sacred," suggesting he holds some antiquated views of women's roles. And Kelly angered the president in January when he suggested on Fox News that Trump wasn't fully informed on immigration issues. Multiple White House staff pointed to the controversy over the allegations against Porter as an instance where the frustrations aides have had with Kelly intersected to make a bad problem worse. They said aides were particularly taken aback by his attempt to inaccurately portray his role in Porter's ouster. While Kelly initially defended Porter publicly, he was even more emphatic in private, four current and former officials said. Kelly, who had access to Porter's FBI file, suggested to aides that he had information that told a different story than news reports and urged Porter for some 18 hours not to resign, the officials said. Once Porter resigned, Kelly stunned aides when he urged senior White House officials in a staff meeting to advance the false narrative that he had ousted Porter less than an hour after learning the details of the allegations, the officials said. One official said that aides who have details that others may not say Kelly is correct that he moved within less than an hour to fire Porter. Kelly has similarly been less than forthcoming at times with the president, officials said. The two men clashed early on over who would replace Kelly as Homeland Security secretary, three current and former officials said. Trump had wanted to consider Kansas Secretary of State Kris Kobach and tasked Kelly with bringing him a short list of candidates, the officials said. After some informal interviews with potential nominees, Kelly gave Trump two choices, according to the officials: Kobach and Kelly's deputy Kirstjen Nielsen. Trump later became convinced Kelly had manipulated the process so he'd pick Nielsen, given the doubts that Kobach could get confirmed, the officials said. "He felt misled," said a senior White House official who was there at the time. Trump was suspicious that Kelly would similarly try to ensure someone he favored would replace former National Security Advisor H.R. McMaster, three current and former officials said. Trump had for months complained that McMaster's briefing style was irritating and would do impressions of the three-star general bellowing out a list of points in staccato, his body puffing up and down as he spoke, the officials said. Sometimes Trump would see McMaster on his schedule and ask aides to have him write up a memo instead, the officials said, so he didn't have to meet with him. The president ultimately settled on a successor for McMaster whom officials said was not a Kelly pick, former U.S. Ambassador to the United Nations John Bolton. Most recently, Trump fumed over reports on a passage in former FBI Director James Comey's book about Kelly calling Comey, after the president unceremoniously fired him, to say he didn't want to work for "dishonorable" people, according to five officials. When reports of the phone call first surfaced last summer, Kelly denied disparaging the president, three officials said. The White House spokespeople said the list of candidates the Office of Presidential Personnel had to succeed Kelly was longer than Kobach and Nielsen, but that doesn't mean it didn't come down to those two once it went to the president. They said after Trump chose Nielsen he saw criticism of her from conservatives and confronted Kelly about it. They did not dispute that Trump imitated McMaster and pushed him off his schedule at times in favor of a memo. They confirmed that Bolton was not Kelly's preferred choice. The spokespeople said Kelly denies saying anything negative about the president to Comey and that it was merely a call to wish him luck.